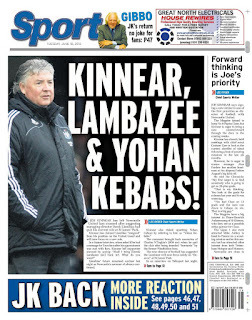 The appointment of Joe Kinnear as director of football at Newcastle United has certainly got the Press's creative juices flowing. Kinnear's interview on Talksport (full transcript here courtesy of The Guardian) was comedy gold. He got several names wrong, including Shola Amamobi (Ameobi) Ben Afri (Hatem Ben Arfa), Yohan Kebab (Yohan Cabaye), Jonas Galteirez (Gutiérrez) and Derek Lambazee. This inspired the Mirror to run its Kinnear quotes tweets including this one: @MirrorFootball Kinnear: "I aim to bring back the glory days of Jill 'Gazza' Gascoigne, Supermax, Sid Waddle and the great Jackie Sunburn." The Chronicle also had a bit of Twitter fun, asking fans 'what would Kinnear call you' and getting some excellent responses. It gets worse though. Kinnear claimed that he brought goalkeeper Tim Krul to the club. Krul has been at Newcastle since 2005, three years before Kinnear shipped up on Tyneside. 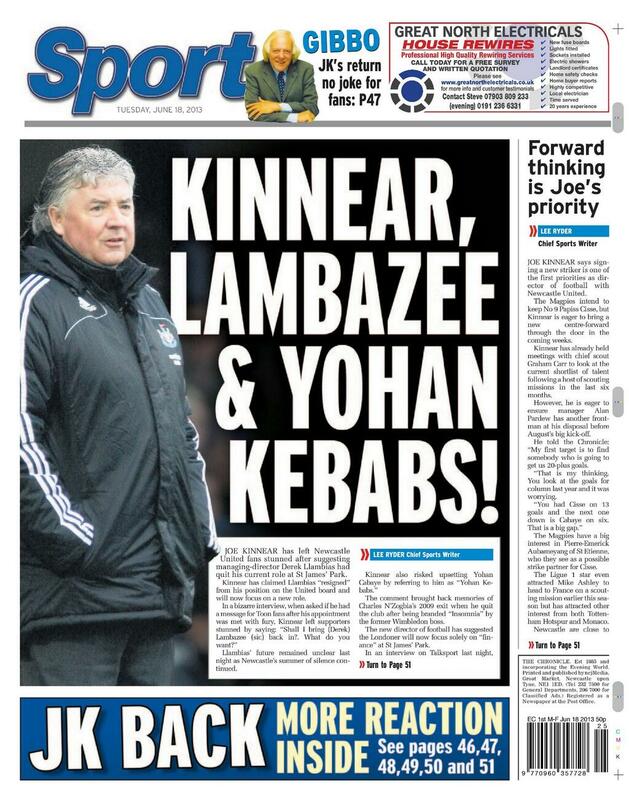 Kinnear also claimed he had never been sacked as a manager. Maybe, but he certainly left Luton abruptly in 2003. On his playing record he said he had played over 400 games for Spurs - records suggest he actually played 196. The Daily Mail neatly turns it all into a true or false game. As you may have gathered there a few truths. Both are innovative and well crafted. The blank page is brilliant. 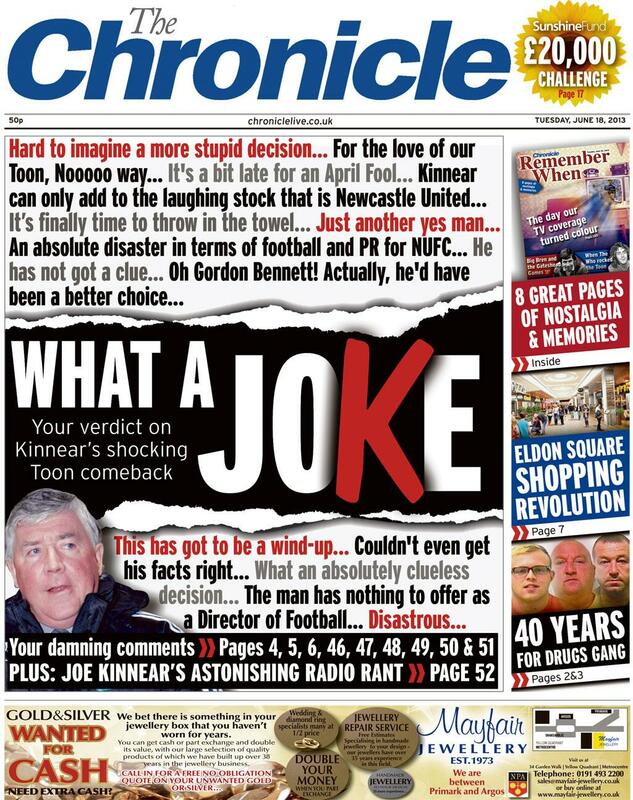 The published page will no doubt get the Chron banned from the Press box but it's good to see a paper saying it how it is, and reflecting the fans' views, regardless of the consequences. One of the best pieces on the whole affair was by George Caulkin of The Times who catalogues the many, many errors in Kinnear's ramblings. It's here ... albeit behind a paywall. 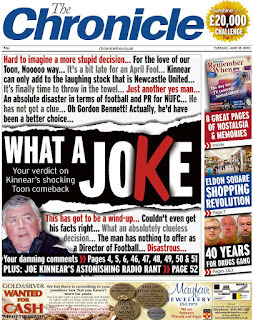 Less articulate - but still funny - is this resurrected video of the fans' reaction when Kinnear first arrived in Tyneside. If you are easily offended, don't watch it. Where does this leave me? Well, I have followed Newcastle United for 50 years so I know what misery means. Last season I spent a small fortune to watch the team routinely humiliated. The nadir was seeing them capitulate 6-0 to Liverpool at St James's. I had opted for a family occasion and bought hugely expensive tickets for second rate sausage and potatoes and no drink. This season I will watch from the sidelines ... unsure whether to laugh or cry.